← A Free Kitchenaid Stand Mixer! Class 2 Wilton Cake Decorating class ended tonight. This is my “graduation” cake. 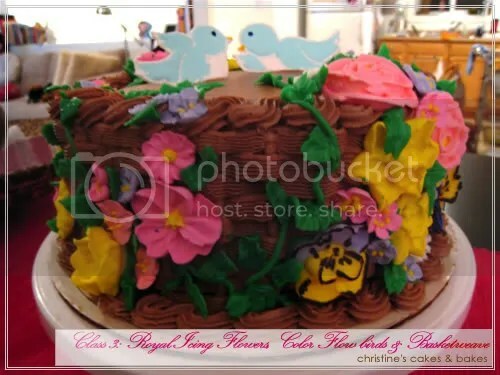 Flowers are made out of royal icing in the past few weeks, and the birds are made with “color flow”. Vines and leaves are made from buttercream. Basketweave, shell border, rope borders and frosting are chocolate flavoured buttercream icing with chocolate brown food colouring added to it to get to the right colour. In this course, we learned how to make pansies, violets, primroses, Victorian roses, rose buds, daisies, mums, apple blossoms, and daffodils over 3 classes (3 weeks, 1 class a week). Royal icing and color flow creations harden really well and can be made well ahead of time. I think I got a little too crazy with the flowers and vines, hence it’s more like an untamed spring jungle cake (I’ve got spring fever due to some crazy frigid weather in Michigan right now). Plus, I didn’t want to arrange the flowers like in the course book, but I rather have them creep up from the bottom instead. Class 3 starts next week and we’ll be making tiered wedding cakes! 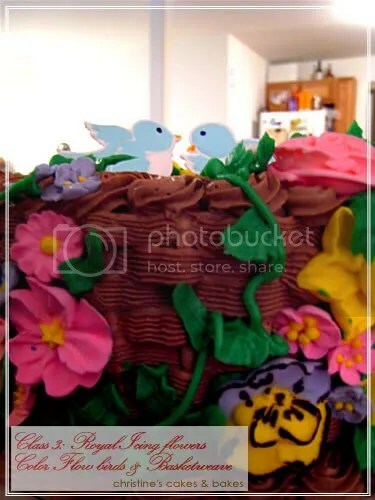 This entry was posted in Cakes n' Bakes and tagged cake decorating, food, Wilton. Bookmark the permalink. Very nice. It’s really lovely! Beautiful! That turned out really well. I am envious of your skills. i feel like in Alice in the wonderland…so fancy dancy n like in a garden…the birds remind me of the snow white singing…. aiyak..the anonymous is me ar…. Wow, this cake is lovely! I think one needs a lot of creativity as well as steady hands to do this and you’ve got it girl! Thanks, Max! It’s really simple. If you’ve got time, try it! You’ll be amazed at what you can do. The classes are very empowering. Wow, my dear I’m really impressed. Keep up with it. Can’t wait to do it with you when we are there. Heehee.. the cake looks much better in person. My camera lense must be greasy from the buttercream.. don’t know why the pics are blurry 😛 I can’t wait to bake and decorate cakes with my family too! Pretty. We’re one week behind and for the life of me I can’t remember the movement for the apple blossoms that I was planning on making today. So I’m looking for a video … Which is how I found your blog. I am planning on taking the Wilton classes within the next few months so this excites me! Great job!!! Wow, that’s really need and nice. I am from the Marshall Islands and I am making cakes but not as good as if had went to Wilson classes. How can I do online courses. Please advise. This is amazing!!! 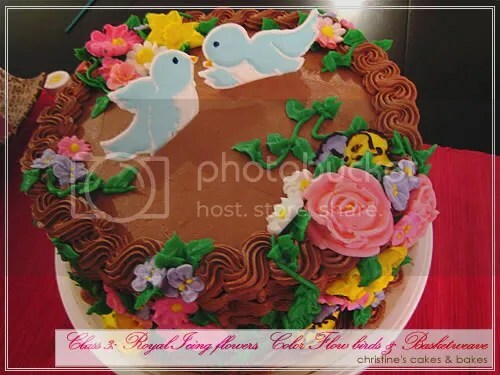 I am taking the course 2 now and was looking for ideas for my final cake and will be borrowing your style here….I love the chocolate background and the vines connecting the flowers. The basket weave was stunning and the birds really make this cake pop. It’s so pretty you don’t want to ruin it by eating it:) great job!